Sometimes I can’t decide what kind of pie to make. 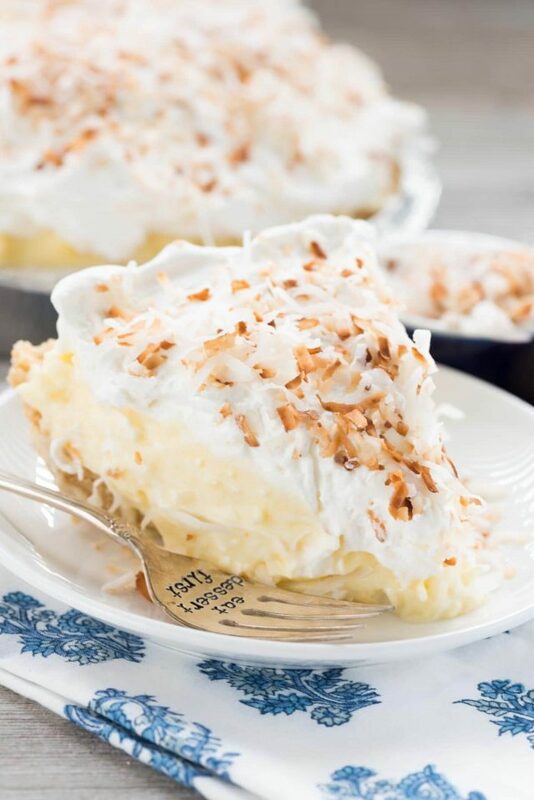 For hours I’ll go back and forth: Coconut Cream Pie? Banana Cream Pie? Which one should I make?? Those sessions are usually accompanied by Facebook pleas and nail biting. Then I just decide to do both…all in one. 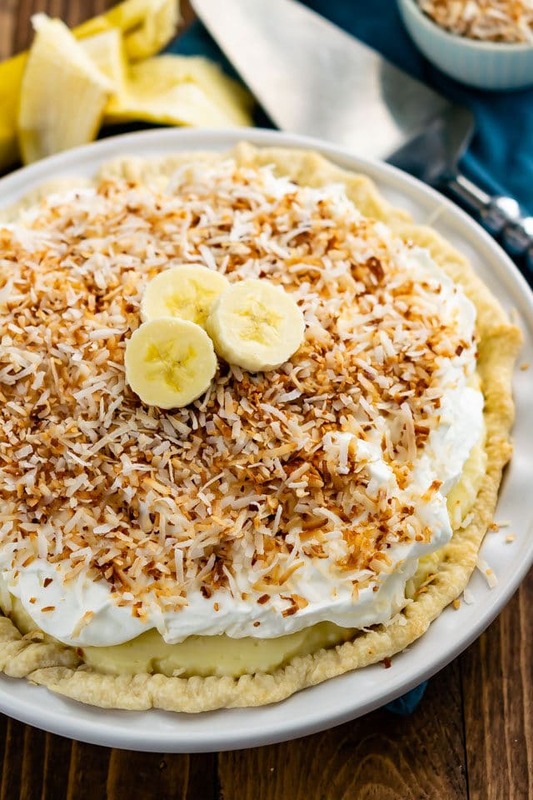 That’s when I come up with gems like this Coconut Banana Cream Pie: an easy pie recipe that’s completely from scratch with the flavors of coconut AND banana cream! Okay, so this pie is off the chain. But first I have to tell you a story about the time my husband ate cookies I didn’t make. A couple of years ago our school had their annual Daddy Daughter Dance. Since I was the head of the committee, I was at the dance the entire time. The kids had a blast and the grocery store cookies we bought flew off the platters. “DADDY ATE A COOKIE!” bursted out of her mouth. When I looked at my husband he had a guilty look on his face. You guys. He ate a grocery store bought cookie. Do you get the problem??? He ate calorie-wasting cookies…but won’t ever eat these. Or these. Or THESE. He doesn’t eat ANYTHING I MAKE…and then he ate a cookie from Winco. He’s lucky there was a gymnasium full of preteen girls or he would have gotten more than a raised eyebrow from me. That has nothing to do with Coconut Banana Cream Pie except that he most definitely won’t eat this: as we’ve discussed prior, he doesn’t like pudding. That’s fine, MORE FOR ME. 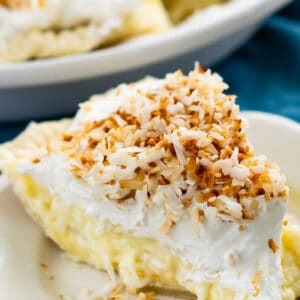 A Coconut Banana Cream Pie is the best of both desserts: Coconut Cream Pie and Banana Cream Pie all together in one easy recipe! This pie is completely made from scratch – that’s right – NO boxes or mixes! While it’s a little bit of a labor of love to make a pudding pie from scratch, it’s worth it. I will tell you that I love homemade pudding 100% more than I like box pudding (and I do like box pudding). The crust, the pudding, and the whipped cream all all homemade and topped with a delicious dusting of toasted coconut. It’s like biting into heaven! What crust is good for a cream pie? Now, normally I’d go the graham cracker crust or Oreo crust route for a pudding pie, but for banana cream or coconut cream pie, the standard is a normal pastry pie crust. I used my favorite all butter pie crust, but you can use a refrigerated one (or even a frozen one). Just make sure you use a 9″ pie plate (not deep dish). You’re going to blind bake the crust, so be sure to check out my tutorial for that. The one thing that is very important about a blind bake:make sure the crust is COLD when it goes into the oven. Have you ever baked a pie crust and had the crust slide down the sides of the pan so you end up with a flat crust? That happens because it’s too warm. I chill my crust several hours before baking it. How do you make pudding from scratch? It’s really actually simple but it does take some time and involve a few steps. There are different ways to make pudding (with eggs, like this recipe or without eggs, like I did for my chocolate chip pie). Even though making pudding with eggs takes extra time, it’s worth it because the flavor is so much better and richer. Basically, to make homemade pudding you whisk together sugar, cornstarch, and milk until it starts to thicken. Once it thickens is when you add the eggs, but you have to temper them. Tempering eggs is when you warm them up before shocking them by adding them to a hot pot. When you’re making custard or pudding you want creamy pudding, not scrambled eggs, so you have to temper them. To temper your eggs, whisk the eggs in a small bowl. Add a bit of the thickened hot pudding mixture – while whisking the eggs – to warm them up, then add them back to the pot, while whisking. That way you have less of a chance of scrambling your eggs. Also – I use whole eggs in this recipe because I hate separating eggs. The whites or yolks I’m not using end up going to waste! Once you have your pudding thick and cooked, you add butter for creaminess and vanilla extract for flavor. 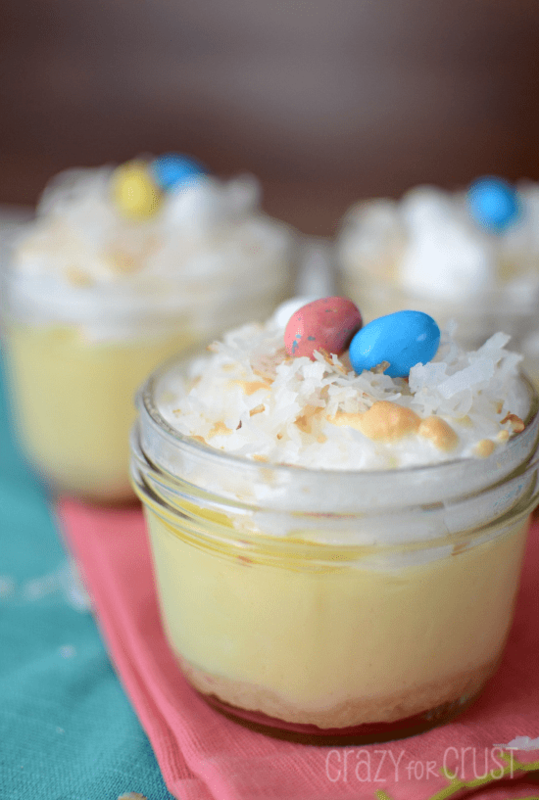 This recipe also uses coconut extract to bump up the flavor of your coconut pudding. TIP: strain your pudding to make sure no egg bits remain. Stir some sweetened coconut into the pudding and let it cool. Blind bake and cool your pie crust. Slice your bananas and add them to the pie with the coconut pudding. Top with a fresh homemade whipped cream, which you can add more coconut extract to, if you want. 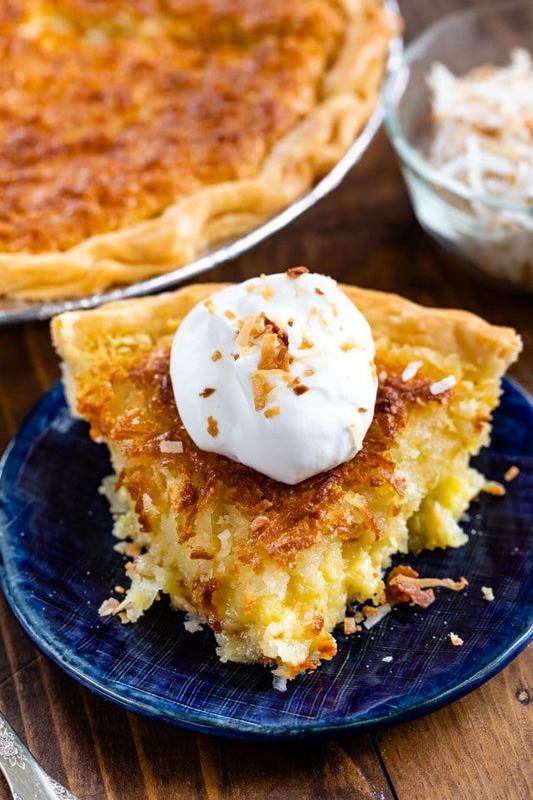 Top it all with some toasted coconut and you have one amazing dessert mashup pie! TIP: if you’ve never done it before read my post on how to toast coconut. It’s easy to do but can burn really fast so be sure to watch it. This pie has a top slot in the pie hall of fame. I mean…it’s two pies in one. 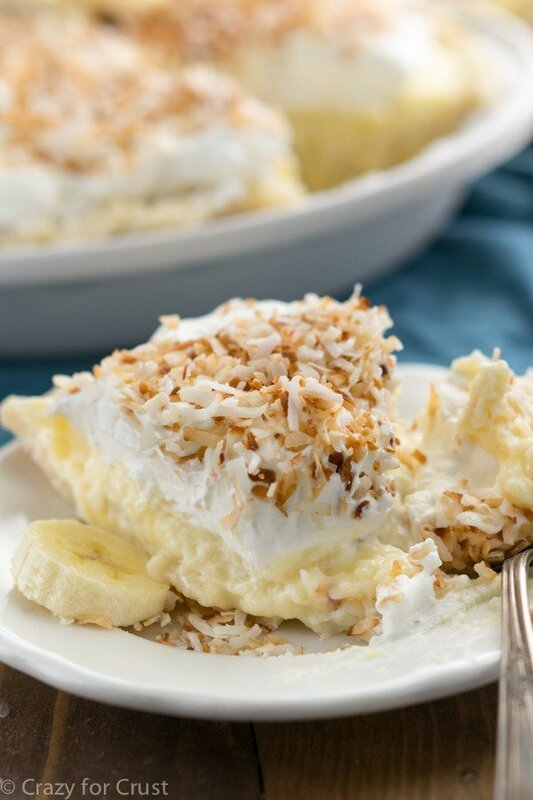 Coconut Cream Pie marries Banana Cream Pie. A from scratch pudding pie filled with coconut vanilla pudding, bananas, and coconut whipped cream! It's the marriage of two amazing pies: coconut cream and banana cream pie! Bake crust according to package or recipe directions for one crust pudding pie. Let cool. Place the sugar, salt, cornstarch, and milk in a medium saucepan. Cook over medium-high heat, whisking/stirring almost constantly, until thick and bubbly (about 7-8 minutes), then reduce the heat to low and cook 2 minutes more. Stir a small amount of hot milk mixture into the lightly beaten eggs. Make sure you’re whisking the entire time so you don’t scramble the eggs. Pour the milk and egg mixture back into the pan. Bring to a boil and cook, stirring constantly, 2 minutes more. It will boil very quickly after you add it back to the pan. Remove the pudding from the heat and stir in the butter, vanilla extract and 2 teaspoons coconut extract. Strain the pudding into a medium bowl to make sure no egg bits remain. Stir in 2 cups coconut. Cover and chill for at least 30 minutes up to overnight. To assemble the pie: place a thin layer of pudding on the bottom of the crust. Place sliced bananas in a single layer and then top with remaining pudding. Cover pie and chill for at least 2 hours or overnight. Toast the remaining one cup of coconut in a heavy bottomed skilled over medium-low heat. Stir continuously until the coconut browns. Remove from heat immediately. Coconut toasts fast and burns fast, don’t stop watching it while you’re cooking! Before serving, make the whipped cream. Beat the heavy whipping cream on high speed, adding 1 teaspoon of coconut extract and powdered sugar slowly during mixing. Beat until stiff peaks form. 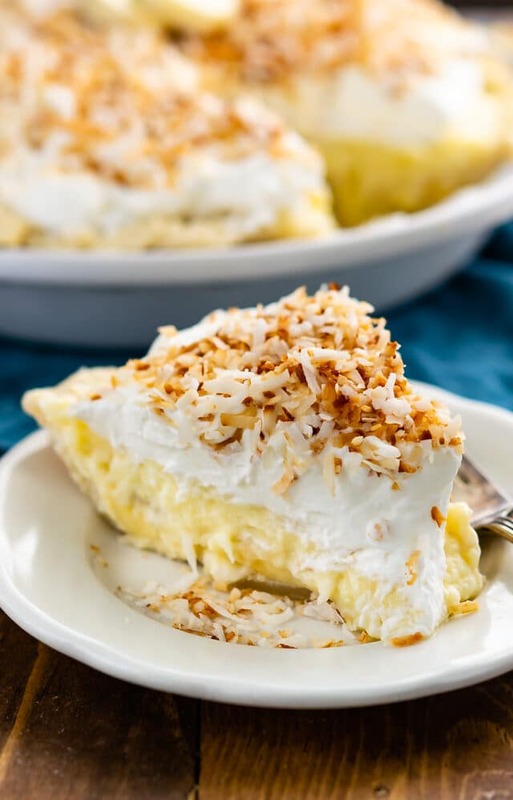 Top pie with whipped cream and toasted coconut. Serve within 2 days. Post originally shared in 2015, updated in 2019. Could you possibly substitute coconut milk beverage for the whole milk? I’m not sure if coconut milk will work to thicken, but you can try it and add more cornstarch if needed! This recipe sounds amazing. I don’t like bananas so i plan to make it without them (or possibly only put them on half the pie since my husband likes bananas). Is there anything I could sub for the bananas? I was thinking pineapple, to give it a pina colada twist, but I’m not sure if the pineapple would work as well since it is not a soft, creamy fruit like bananas. I think I’ll use real vanilla bean (scraped) in place of the extract, because I love, love, love vanilla and I have some on hand that need to be used before they dry out. You can definitely leave out the bananas. If you use pineapple just make sure it’s really drained well and blotted dry. Let me know how it works! HOW can a man NOT like pudding? HOW can ANYONE not like pudding? Did he grow up on instant cold, nasty, gritty pudding from a box? Sure, I can see perhaps the cold instant Jell-O pudding. That can be pretty nasty at times. I only keep it in the house because at times cake recipes call for it. If I’m feeling VERY lazy, which I often am at 10 pm on a cold winter evening I will quickly grab a box of COOK and serve pudding but I wouldn’t eat that cold instant stuff for anything. I grew up on homemade pudding, which by the way they called “cornstarch”. I guess because that’s the major ingredient in it other than the milk. Your husband is a RARE breed to be sure if he turns down ALL those desserts and treats. What happened to him during his childhood to traumatize him in such a drastic manner? Now I’m not a big chocolate lover, not like many people but that doesn’t mean I dislike all desserts. I’d rather have vanilla or lemon. I just made this for Thanksgiving as I am a guest. It came out amazing! Its firm and delicious. I followed the exact directions. I printed it out and put in my files as a keeper.